Let us look at some of the advantages of security gates, at the different types that can help you make a statement.. The main advantage of security gates is that it offers an important form of security. If you choose a hard material type - like steel - your gates will remain strong and in place with correct maintenance. For your safety and peace of mind it is a huge advantage to have well placed security gates. Security gates not only work to keep people out, but it also keeps children and pets safe in your yard. You can rest a little more assured that your children are safe in your home and there is no danger of them wandering out into traffic. Gates fitted with electric gate motors are a convenient security feature to add to your home. Driveway security gates fitted with an automatic motor allows you to enter and exit your property without having to physically leave your vehicle. This is a huge security feature for you. 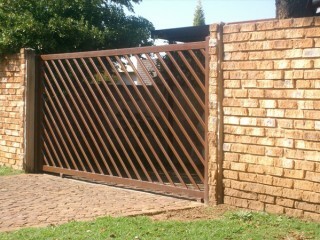 Security gates, especially motorised gates at the driveway entrance, will most definitely add value to your property. Looking for a custom security gate design? Contact Country Wide Walling today for a free quote.